You want to create a spending plan, but you don’t want to make an intricately detailed line-item budget or budgeting worksheet. Instead, you just want a budget that represents a "broad overview." At the same time, you don’t want to make a budget that's as broad as the 80/20 budget or the 50/30/20 budget. Those examples limit you to only two or three categories. The 80/20, for example, simply advocates committing 20 percent of your income to savings and 80 percent to everything else. While it's a good idea to commit 20 percent of your income to savings, you might want more detail for the rest of your income than simply everything else. You want something a little more specific and structured. Like Goldilocks, you're seeking a happy medium between two extremes. The budget you want should allow you to break down your spending into five or six categories: not too few, but not too many. What should you do? Housing should comprise 35 percent of your take-home income. That includes the mortgage or rent, all home repairs and maintenance, property taxes, utilities such as electricity, gas, water, and sewer, and homeowners or renters insurance. In short, it includes every housing-related expense. Transportation should take up no more than 15 percent of your take-home income. That includes any car payments you’re making, gasoline, car insurance, all repairs and maintenance, the amount you pay for parking, or—if you ride public transportation—the amount that you pay for train or subway tickets. Remember, transportation isn't just your car payment. It includes everything: your car payment, your oil changes, your tune-ups, and your new radiator and timing belt. Other living expenses, which are predominantly discretionary expenses, should take up 25 percent of your income. This includes eating at restaurants, buying concert tickets, buying new clothes, going to sporting events, and taking the family on a nice vacation. Savings should consume 10 percent of your budget. This is predominantly for retirement as well as building an emergency fund. Debt Payoff should consume 15 percent of your income. This includes your credit cards or student loans. It does not include your mortgage payment or car payment, which are listed under "housing" and "transportation." It does include any extra payments you're making toward your mortgage and car loan above and beyond the minimum. You might be thinking: Wait a second, why are you advocating a savings rate of only 10 percent? Don’t the 80/20 budget and the 50/30/20 budget both advocate savings rates of 20 percent? Yes, they do, but as you’ll notice under the 80/20 budget and the 50/30/20 budget, "savings" included debt paydown. In this five-category budget, your savings and debt are listed as two separate categories. 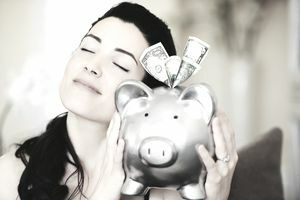 With 10 percent for one and 15 percent for the other, you’re actually spending 25 percent (in total) on a combination of savings and debt pay-down. This is even more aggressive and ambitious than the other two budget models recommend. Use this five-category budget if you would like to create something slightly more detailed, but not too complex.